Since I haven’t had time to work on any of my larger genealogical projects, I thought I’d share a smaller one today. This photo is from the Joseph DeKorn collection. He was my great-grandmother’s brother, and he took a great number of our family photos during the very early 1900s. Because someone took the time to write on the back, I felt that this photo was important to someone in the family. In fact, I believe the handwriting belongs to Uncle Joe. Timber trestle bridge over the Huron River at Ann Arbor was designed and built by Professor Charles Ezra Greene. 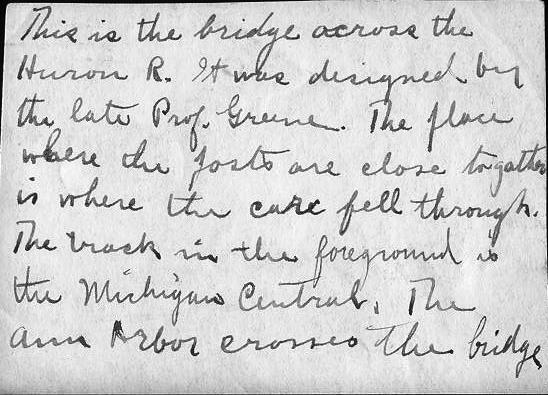 This is the bridge across the Huron R. It was designed by the late Prof. Greene. The place where the posts are close together is where the [?] fell through. The track in the foreground is the Michigan Central. The Ann Arbor crosses the bridge. Where the WHAT fell through? Does that say “where the car fell through”? Did someone’s car fall between the posts into the river? There was no limit on the methods used by rum-runners to import alcohol across the river. Government officials were unable or unwilling to deter the flow of alcohol coming across the Detroit River. In some cases, overloaded cars fell through the ice, and today, car parts from this illegal era can still be seen on the bottom of the river. But that’s not the Huron River. And what time period are we talking about for this photo? On the back, it says “the late Prof. Greene.” Here is biographical and obituary information about Professor Charles Ezra Greene. He died in 1903. So the photo was taken at some point after that. 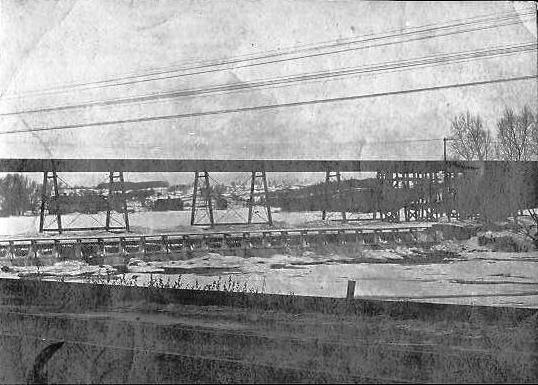 A steel bridge eventually replaced this bridge, and it might have happened in 1924. [Professor Greene] entered the Massachusetts Institute of Technology. Here he was graduated Bachelor of Science in Civil Engineering in 1868. From this time until 1870 he was Assistant Engineer on location and construction of the and Railroad in Maine. The next year he was United States Assistant Engineer on River and Harbor Improvements in Maine and New Hampshire, and was then appointed City Engineer of, where he also carried on a general practice until the summer of 1872. In that year he was appointed Professor of Civil Engineering at the University of Michigan, a position which he held to the time of his death, October 16, 1903. When the Department of Engineering was established as a separate organization in 1895, he was made its first dean. In 1884 he received the honorary degree of Civil Engineer from the University of Michigan. In addition to his duties as professor he carried on an extensive consulting practice. He was Chief Engineer of the Toledo, Ann Arbor, and Northern Railroad from 1879 to 1881; Superintending and Consulting Engineer of the Wheeling and Lake Erie Railroad bridge at Toledo in 1881-1882; designer and Superintendent of the construction of the Ann Arbor water-works in 1885; and designer of the Ann Arbor sewerage system in 1890. He paid special attention to the invention and development of graphical methods of analysis of frames, bridges, and arches. He published several works which were well received by the profession and which have been used in designing important structures: “Graphical Analysis of Bridge Trusses” (1874); “Trusses and Arches, Part I, Roof Trusses (1876), Part , Bridge Trusses (1878), Part , Arches (1879) “; “Structural Mechanics” (1897). He was a member of the American Society of Civil Engineers; also of the Michigan Engineering Society, of which he was president for three terms. In 1872 he was married to Florence Emerson, of , Maine, who with their two children survives him, – Albert Emerson (Ph.B. 1895, B.S. [ ] 1896) and Florence (A.B. 1903). 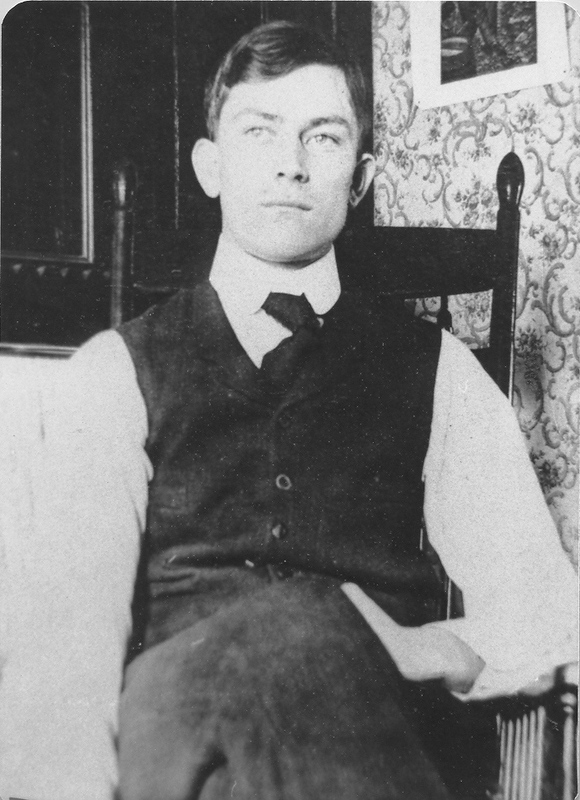 Joseph DeKorn attended the University of Michigan at Ann Arbor. I’ll make a guess he took the photo when he was a student at Michigan. This helps narrow down the date of the photo because Uncle Joe was born in 1881, so he would have been studying at the university in the first few years of the 20th century. What is perhaps very telling is that Uncle Joe studied Civil Engineering, so perhaps he was a student of Professor Greene before the man died. It does sound as thought Professor Greene taught up to the last. It also sounds as if he was an amazing teacher. At the least, Joe would have learned of Greene’s influence in the classroom. Joseph DeKorn stayed true to his studies and went on to become Chief or Supervisor of City Light and Water for the City of Grand Rapids, Michigan. Additional information provided by my uncle in a comment to this post: Charles E. Greene was indeed Joe DeKorn’s prof. He learned both what to do and what not to do from him! Joe DeKorn was in charge of building the Grand Rapids water system which to this day draws it’s primary water from Lake Michigan. As Uncle Don says, it was a big project! What do you think that he writes on the back of the photo? Does it say car or cars? Or something else? This article is from the January 29, 1904 Kalamazoo Gazette. There is a long article in the Ann Arbor Argus-Democrat on the same day. It indicates a dispute over the cause of the accident and says that actually 13 cars were destroyed. But the bottom line is that it was NOT a defect in the bridge that caused the accident, but a broken flange on a coal car. I think it does indeed say “car” or “cars” – it would make sense, though I find it strange such a incident would not have made it to the local newspapers at least! Have you considered checking the local press archives? I love uncovering old family photos, especially if they have some sort of story behind them (literally!). Ah, I’m glad I wasn’t making that up! I can’t imagine that it would be anything but car or cars, can you? I have tried to search newspaper through Genealogy Bank, but didn’t come up with anything. I tried putting in Huron River bridge Ann Arbor car fell–words like that, but nothing.Let me know if you can think of any better words to check or a better online site. Thank you!!! Mystery was solved–I updated the post. It was a train accident! When I first read the note, I got the impression that the car most likely slid off the ice and fell into the river, probably not an uncommon occurrence. I did a little research and found an interesting piece on Prof. Greene which gives more detail of his specific contributions and character. It also might give you some clues as to the time of Joseph’s connection to him. Here it is. The link does not start at the beginning of the article…it actually begins on page four and is quite interesting. Mrs. P, what a great book! I really haven’t even begun to think of looking for whole books on Google! The link took me to the book itself, but I read part and skimmed the scary part of that first piece that was written by Professor Greene. That really gives some insight into what a serious college major and career Joe DeKorn ended up having. I found all that algebra quite frightening ;). But it’s so cool that he’s talking about how to build trestles when the bridge in the photo is in fact a trestle bridge! I do like to take detours like this when I do my research…it just gives a lot more depth to the history I have uncovered. I thought I’d let you know that the mystery was solved and I updated the post. It was a train accident! Greene was his prof and he learned both what to do and what not to do from him! Joe dekorn was in charge of building Grand Rapids water system which to this day draws it’s primary water from Lake Michigan. A big project! Another u of m grad and family member Harold remine built the large Canadian electric power plant and related transmission lines– called Montreal or Quebec hydroelectric plant. Wow, this is great information you have! I will add this information about Joe to this post. And I plan on doing a Harold Remine post sometime in the future. Thank you! Uncle Don, I wanted to let you know I updated the post because a friend pointed me in the direction of a train accident and I found the newspaper articles online. It’s so wonderful to get all this help from readers!! Gee, that was fun! At first I thought the old curé had gone through the ice, leaving the parish without a priest. I like the real story better. Hahaha, well, that one is pretty good, but this one is definitely less sad in its outcome. Thank you for stopping by my blog. I have a lot of early entry on genealogy as that was my initial passion when I started blogging. Since then, I have expanded into various topics, but I still love the connections one gets through ancestry work! I spent almost the entire 2012 studying connections in our family and it was such a great adventure! What a lot of fun! It is definitely an adventure, sort of an armchair adventure! Great story.. . I really enjoyed reading it and the wonderful update after the mystery was solved. Sheryl, thanks to readers for putting together all the pieces!